RegFromApp monitors the Registry changes made by the application that you selected, and creates a standard RegEdit registration file (.REG) that contains all the Registry changes made by the application. You can use the generated .REG file to import these changes with RegEdit when needed. How to extract: Download the ZIP package and extract to a folder of your choice. Launch RegFromApp.exe. Fixed RegFromApp to avoid from BSOD when trying to attach to smss.exe (Be aware that RegFromApp will still fail to capture the smss.exe process). I find that RegFromApp will only capture reg writes if the app your monitoring is actually doing the writing. Let's say your monitoring an app/installer that creates a 'Working directory' e.g. %temp%/MonitoredApp and dumps some files that now write to the registry, these writes do not get captured because the monitored app is not doing the writing. 1. In concert with Regshot: RegFromApp will only capture writes from the program not the system. The only problem is that when I "Make Chromium my Default Browser" it doesn't transfer the command line to the registry. By starting Chromium from/within RegFromApp as an admin I can capture these reg entries and export for editing (search and replace) with a text editor and add the command line and merge back into the registry. only problem i run into with this wonderful app is it doesn't work for all apps. 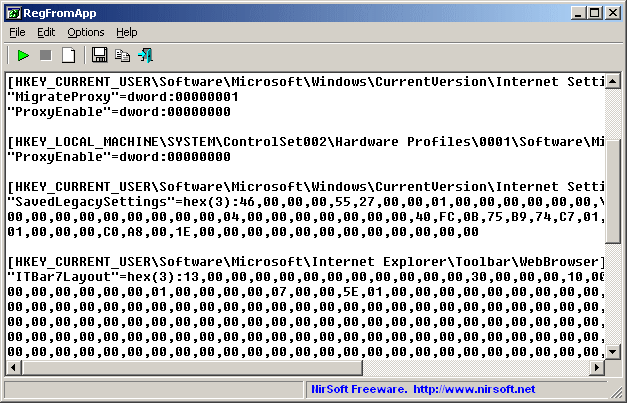 I'm using in Win7 Ultimate 32bit and its working fine. Once you select process to gather information, nothing displays. Tried several processes and all do not display any registry entries. Ran as Administrator, only have option to stop. same same here, can't make it run, you had any luck? Has anyone else had an issue getting this to do anything useful in Windows 7? Either it fails to start the process I tell it to, or if I hook it to one, it doesn't report any changes whatsoever. Tried running it as administrator. Yeah, I've been using a batch file for years now to do just that--load programs' settings to the Registry and delete them when they're closed. (It's at http://j44xm.notlong.com, if you're curious.) So this program looks very interesting to me. I could make a script that uses this to make any program portable. It would still write to the registry, but it would delete the entries reported by this program after use.